“He’s always helping people,” Dr. Jase says of his younger brother Justin. “But he gets himself into the funniest situations.” An avid Samaritan since a young age, Dr. Justin has often looked for ways to help people. During a two-year service mission in Mexico, Dr. Justin was asked by a family to “help” them by preparing a pig for their daughter's 15th birthday celebration. Having no experience with the task but not wanting to leave the family without help, he reluctantly agreed. More than an hour later, covered in dirt and mud, Dr. Justin came back with a lot more experience than he wanted. After his mission and completion of college, Dr. Justin attended dental school at the University of North Carolina at Chapel Hill. He admits that he knew he wanted to be in dentistry since Boy Scouts, where his leader was an orthodontist. While in dental school Dr. Justin had braces as a patient and discovered his passion for orthodontics. His academic achievements, including graduation with honors, earned him a spot in the orthodontic residency program at the University of Oklahoma. 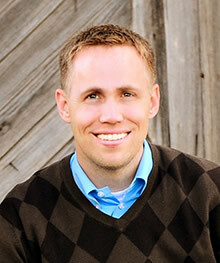 In 2010, Dr. Justin graduated and became a board-certified orthodontist. Later that summer, alongside his brother and best friend Jase, Dr. Justin opened Olsen Orthodontics and knew he would be a part of something great. He would have the chance to help others and really change lives. Dr. Justin is a member of the American Association of Orthodontics, Southern Association of Orthodontics, American Board of Orthodontists, and American Dental Association. Dr. Justin loves golf, woodworking, and wearing vibrant and interesting socks (just ask to see them)! He adds that he always has time for a joke or two, as long as they are clean. His greatest joy, comes from his family and spending time with his three children.